So I’ve had a bit of a rough week here food-wise. Dave and I attended an event this past weekend that had us there 8am-8pm both Saturday and Sunday. In all the fun and work, we forgot to do our meal plan and go grocery shopping!!! Monday came and we had that YIKES moment! Neither of us really has time to make it to the grocery store during the week days (although I’m thinking of skipping out on an event I’m supposed to be at tonight and make a trip to Earth Fare before bedtime…). We’ve been eating from what little we have in our pantry, which has mostly been steal cut oats for breakfast with frozen blueberries and coconut milk, black beans and salsa mixed together over spinach for lunch, and frozen broccoli and black beans for dinner. That’s been our life the past three days. I’m getting sick of it! If you follow this blog you know I love my variety, so this has been torture! I just finished my beans & salsa salad for lunch, and boy was I craving something sweet. We have a roommate here in Charlotte, and she had offered us two avocados she’d had on her counter for over a week. She said she didn’t know what to do with them. I told her I’d whip her up something tasty. ;) And I saw in the fridge she had a bag of limes. Eureka! So here is my after lunch sweet treat, which I was inspired to make from my signature and most favorite dessert recipe Raw Key Lime Pie. This simple twist on my key lime pie recipe is quick, requires just a few ingredients, and tastes SO GOOD! Add all ingredients to your blender and blend on High until smooth. Serve immediately or chill for an hour or two before serving. 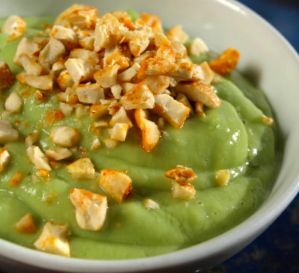 I topped with crushed almonds to add a little protein and mimic pie crust. DEEEElicious! I went ahead and used standard limes that you’ll find at your grocery store (Tahitian). However, you can definitely go ahead and use Key limes if you have them or find them. Key limes are naturally sweeter than Tahitian limes, so you can go a little less on the stevia. Video: Making Chocolate Pudding with Dr. Scott! can it be frozen successfully? Yes, and after freezing, you may like to turn into ice cream by blending in the VitaMix. Super yummy! !